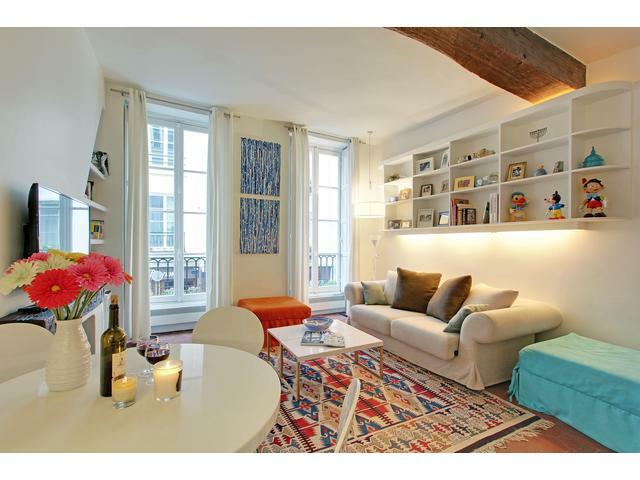 This luxury one bedroom apartment is perfectly located in Saint Germain des Prés, 7th arrondissement. 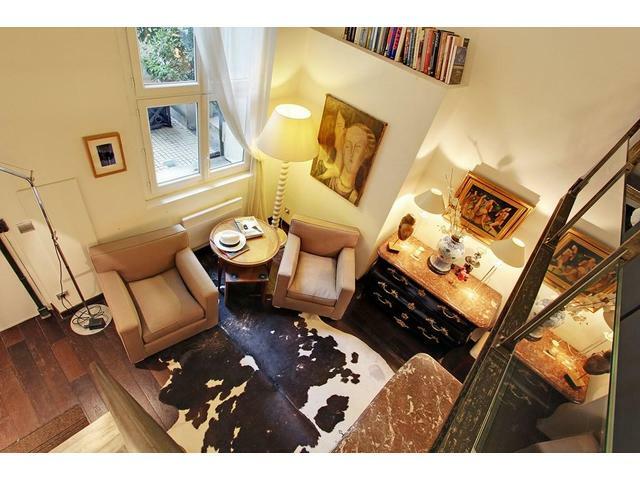 Situated on the quiet Rue Perronet, it is 1 min away from the Boulevard Saint Germain, and 4 min from the famous Place Saint Germain des Prés. On the 1st floor (2nd American floor) without an elevator, it features a cosy living room, and a charming bedroom with a terrace. It is perfect for a family. This apartment of about 50 square meters (or approx. 538 sq ft) features a large living room with two luminous windows on the street side, a high-quality convertible sofa (140x200 centimeters), a dining table for four, a decorative fireplace with coats of arms, a coffee table, a cable TV, and two poufs that open into futons (80x200 centimeters). The kitchen is part of the living room and includes a stove, fridge, microwave, dishwasher, and drying washer. The apartment is equipped with air conditioning. The quiet bedroom, on the court side, features a king size bed (160x200 centimeters) and another TV. Access the charming outside terrace from the bedroom, and enjoy your breakfast with the outdoor furniture. The bathroom, located next to the bedroom, includes a shower, and a sink. The toilet is separate from the bathroom. The apartment is on the 1st floor without an elevator of a building dating from 1880. Rue Perronet is a small and quiet street off the Rue des Saint Pères that crosses the Boulevard Saint Germain in the 7th arrondissement. 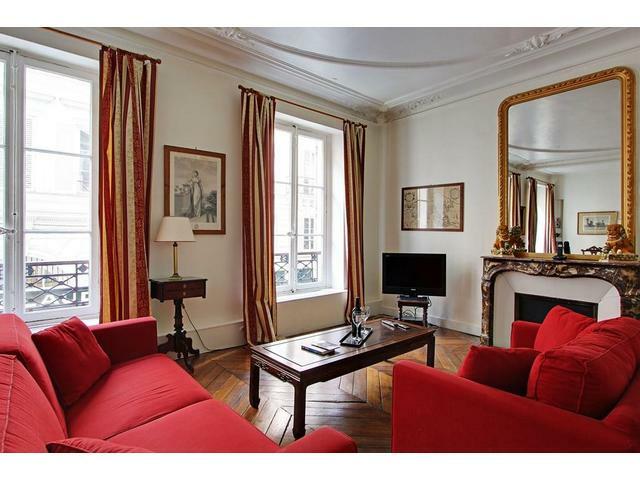 The Place Saint Germain des Prés with the Saint Germain des Prés Church is just 4 min away. Enjoy “people watching” at the Café de Flore, or Café des Deux Magots. 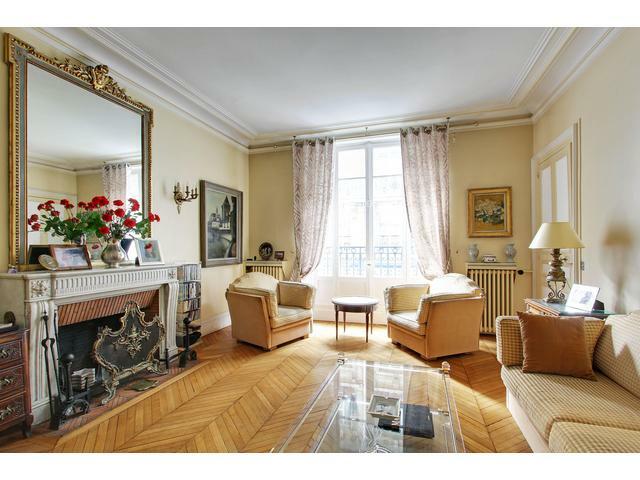 The apartment is at a walking distance to many attractions in Paris: 5 min to the Seine River with boat cruises, 10 min to the Louvre Museum, 15 min to Place Saint Michel with the Latin Quarter, 20 min to Notre Dame Cathedral, 10 min to Place Saint Sulpice with the beautiful Saint Sulpice Church, 35 min to the Eiffel Tower, and 10 min to the Luxembourg Gardens. It is perfect for a family! 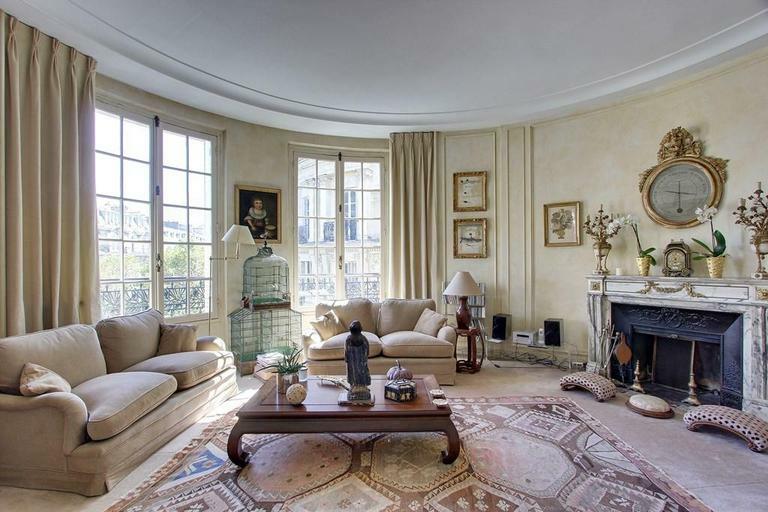 This refined three bedrooms, and three bathrooms, apartment is perfectly located on the Boulevard Raspail, between the famous Place Saint Germain des Prés and the Luxury Department Store Le Bon Marché in the 7th arrondissement. Ideally situated in the heart of Paris and with its exceptional design and typical decoration, this apartment will help make your stay unforgettable. On the 5th floor of a French Haussmanien building with an elevator, it is fully furnished and elegantly decorated in an authentic French classical style and can accommodate 6 people. 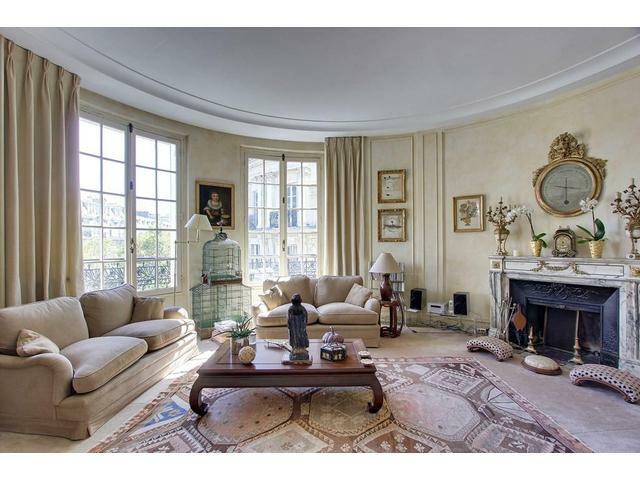 This spacious apartment of 125 m2 (about 1345 sq ft) is the perfect example of French charm. It features an entrance hall which provides access to the kitchen and the spacious rounded living room. Very luminous and on the street side, it includes 2 sofas, a coffee table, a decorative fireplace, a dining area with a table for 6, refined decoration with antique furniture and beautiful bird cage, chairs, windows shutters, art pieces and many charming elements which make you feel in a cosy French interior of the early 1900’s. 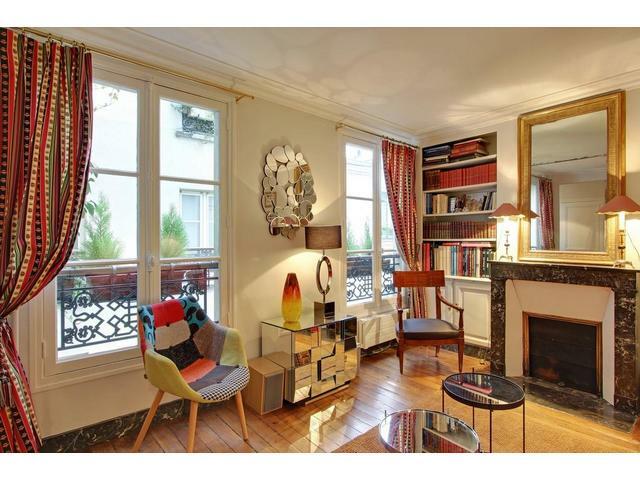 You will feel at home in this beautiful apartment, and enjoy the view on the Blvd Raspail. The apartment is equipped with internet in wifi and carpeted floor. The round-shaped kitchen is fully equipped with a counter, a bench and two stools, a large fridge (and freezer), coffee machine (espresso), boiler, toaster, blinder, oven, micro-oven, a gas cooktop, dishwasher, washer, dryer and all the amenities to prepare and enjoy a meal. Enjoy the lovely light in the afternoon with its south exposition. Follow the hallway from the entrance and you will find the three bedrooms and the three bathrooms. The bedrooms are all on the street side with large windows, a refined decoration “à la Française” and the large curtains of each space offer a romantic and hushed atmosphere. You won’t hear the noise from the street has all windows have thick glazing. The first bedroom features a queen size bed (160x200cm), a chest of drawers, a bedside table, several closets, television, telephone, internet shelves with many books and DVD and beautiful art paintings. The warm atmosphere of the second bedroom is very cosy. It features a king size bed (180x200cm), a large and beautiful mirror, a television, two low chairs, a bedside table, closets and beautiful decoration on the walls. The beautiful rounded third bedroom situated at the extremity of the apartment features a small double bed (120x190cm), a decorative fireplace, a cute table with flowers, a wooden chest of drawers, television, cloth blinds and a has its own private shower room with sink and bath towels warmer. All rooms are equipped with shutters, curtains or cloth blinds. The attractive main bathroom situated in the hallway features a bath tub with shower, a large double sink and a large mirror. The third shower room is also situated in the corridor just near the separate toilet and features a shower and a sink. This apartment is the perfect place for families, couples or group of friends who wish to discover the heart of Paris as a true Parisian. It is located at a walking distance to many commodities and commercial streets with many shops such as fashion and food stores and close to the metro stations Sèvres Babylone and Rue du Bac (3 min walk). It is 5 min away from Le Bon Marché, the first ever modern department store founded in 1852 with luxury brands from over the world. Enjoy the Square Boucicaut, a green park in front of Le Bon Marché where you can rest after a day of shopping! You are at a 15 min walk from the famous Place Saint Germain des Prés with its refined cafes and restaurants. This apartment is also close to many attractions in Paris such as Place Saint Sulpice (15 min), Montparnasse (10min), Luxembourg Gardens (15 min), Louvre Museum (25 min) or the Eiffel Tower (30 min). Just let yourself be carried away by the romantic atmosphere and the history of this charming apartment which will make you enjoy your stay even more!